Firstly, I have to share my excitement at the cover, above. When I was sharing emails with the publicist about the book, I expressed my happiness that author Kerr and the team behind her hadn’t decided to go down the typical romantic cover path. Having read the book, I now think this is even more of a wise decision – it has some of the techniques of a typical romance, but this isn’t your straightforward Regency era love story and doesn’t fall back on too many of the irritating plot devices that us Regency-readers are way too familiar with. While the novel does bring in new characters, such as Clare, Lord Ashwell and Lady Sofia, it does so without it seeming contrived. It peers behind the cover of other characters, such as Anne de Bourgh and Georgiana, and explains to us just why they are the way they are in Pride and Prejudice. Unfortunately, it does leave us wondering why Jane Austen ignored them in her original novel – which explains how close it goes to providing a believable early alternative. This is Kerr’s first book, and her background studying linguistics, English and theatre at the University of British Columbia and law at the University of Alberta has no doubt helped her with this debut into novel writing (as has her Jane Austen Society of North America attendance). We start this Pride and Prejudice prequel about a year before Jane Austen’s version of events begins, and this matches up perfectly with the ages and events to take place as per the information given by Jane Austen, such as Georgiana’s age. I have seen far too many a prequel ignore the clues we are given by Austen as to the circumstances prior to the novel, and Kerr does not fall into this trap. It was a nice touch to see Caroline Bingley and George Wickham almost paired together (and to actually feel a lot of sympathy for Caroline throughout the book). It’s an intriguing extra connection and it explains to me one of the inconsistences, if you can call it that, of the novel itself. By that I mean that the quote below always struck me as odd. Surely, she’d want Elizabeth to show as much interest in Wickham as possible, so that she could keep Darcy to herself? At first I was concerned that Clare would bore me as one of the new major characters. She’s very righteous and perfect, reminding me a little of Fanny Price, with her one flaw seeming to be a penchant for “racy” (if you can call them that) romance novels, that she does everything possible to steer clear of anyway. It’s nice to see her become a little more fearless in the face of Georgiana and Wickham’s elopement and become the true heroine of the novel – shaking off her class and background. There’s also the suggestion at the end of the novel, that reminds me of the close of Emma and the way we’re told Knightley and herself balance each other out, that she will be a little less strict with herself going forward. Pride and Prejudice lovers will already know the name Mrs Younge as the woman who conspires to allow the “almost elopement” of Georgiana and Wickham. I absolutely loved the unpacking of her character, and the strength of her control over Wickham. Presenting the underclass, but with a smart woman who easily gets what she wants, it’s a quick reminder of the sordid side of Regency society. It’s interesting to see how far name-dropping, a good recommendation and the knowledge of others’ fallibilities can get unworthy characters in the book – and, of course, in real life sadly. There are a number of similarities between the Clare/Lord Ashwell romance and the Elizabeth/Darcy storyline, not in the least the misunderstandings, another Collins-like character, and the gentleman’s generosity in doing something towards their love interest that comes under the guise of being from someone else. One minor criticism I do have (and spoiler alert) is that if Darcy saw the happiness of the relationship between lower-class Clare and upperclass Ashwell, and eventually dealt with it… surely he’d be more inclined to be more flexible to this type of a relationship – such as with Jane and Bingley – by the time Pride and Prejudice appears a year later? I loved the concept of these unwritten characters that drove the storyline to where it is when Pride and Prejudice opens, and Kerr really does this flawlessly. I did feel the loss of Lizzy in the storyline keenly – which she has written a great character with Clare, and has done well, I always miss my favourite character in prequels that omit her. While I don’t consider it something Jane Austen would have written – there’s a bit of restraint missing in even our most upright characters (I doubt Jane would ever have had Clare knocking on Wickham’s door, nor would have written in so much detail about death bed discussions) – I found it thoroughly enjoyable, and exactly what I wanted to read. Kerr has done an excellent job, and I think Pride and Prejudice lovers will adore this. When did you first read Pride and Prejudice, and what did you think of it? How long did it take you to write the book, and what research did you have to do? The book took about a year and a half to get a first draft, then several months of editing. I had actually done a lot of the research before writing it, just by all the Jane Austen events I had attended, and the reading I had done just out of interest. That kind of gave me the framework for knowing what I still had to look up. I have thanked Wikipedia in my acknowledgements in Follies Past, because without it, or the internet in general, really the book would never have been written. I have two small kids at home, and I work as a lawyer, so if I had actually had to go down to the library and take out books, I would not have had time to do that kind of research. I have a blog on which I write posts about the interesting things I have discovered in the course of my research, and of my life as a geek. One subject I love to write about is the difference between our modern English usage and the usage that was current in the time of Jane Austen. I have always been fascinated with language. 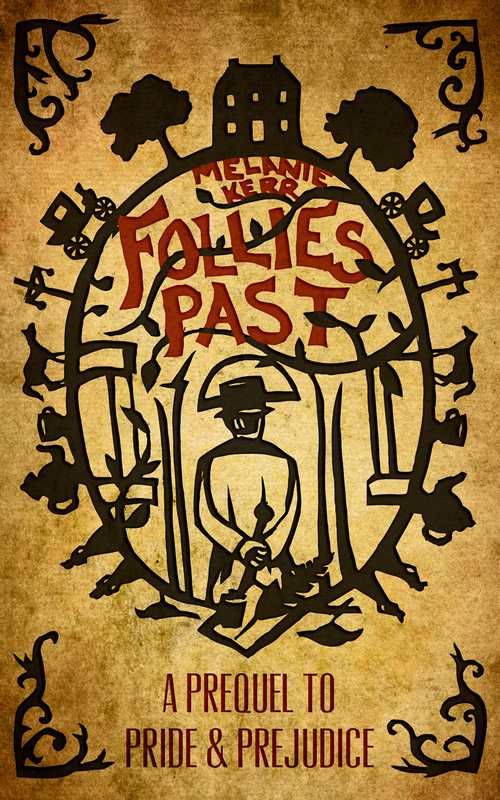 In university I studied Linguistics as my major, and that was an important knowledge base to have in approaching a book like Follies Past, which uses 200-year-old language. There are a lot of differences in the ways we express ourselves. If you watch movies that are even just a decade or two old, you pick up on changes in the way people talk, expressions, the way we used to use certain words. That is constantly happening with language, and you can imagine that if language has changed noticeably since the 90s, it must have been quite different in 1810. Where did the idea for the character of Clare come from? In university I did a minor in theatre, specifically acting. I didn’t notice it at the time, but looking back on my writing process I have noticed how much writing and acting involve the same skills. They are both about identifying with the characters, finding those parts of yourself that are the same as the character and then following them through into their current situation. There is a line in the book that says, “Clare was a very good sort of person who felt that her very human flaws rendered her very evil” or something like that. We all judge ourselves, even when we don’t deserve it. I also wanted to explore the idea of our self-perceptions in contrast with the world’s perceptions. We often see ourselves very differently from how the world sees us, and when we hide things from the world, when we are not honest and genuine, when we are too perfectionist, there are risks of developing really bad habits and just covering them up with a front of goodness. Clare’s flaw is pretty benign and kind of funny. She is so ashamed of her love of novels because her parents were so moralistic in their parenting and not very skilled at intimacy. But if you look at Wickham, you see where this leads. Externally, he is everything charming and courteous, but privately he is selfish and destructive. The difference of course is that Clare actually cares about being good, actually cares about other people. She has strength of character, which is always what prevails in Jane Austen’s works, and in most literature. The relationship between Clare and Lord Ashwell is actually all about first impressions, rumours and class distinction – were you intentionally keeping the themes from Pride and Prejudice? These themes are very strong not only in Pride and Prejudice but really in all Jane Austen’s works. When writing Follies Past, my intention was not to copy any particular plot lines or character types, but to create something that felt like one of her creations (bearing in mind, of course, that her genius can never be imitated). The kinds of themes, of story arc, of situations, of language, of rhetoric that she used were like my compass. I didn’t ask what happened in any particular book, but I did ask what kinds of things happen in all her books. And I build my story with those principles in mind. We’re all dying to know – in a Pride and Prejudice sequel situation – would your Colonel Fitzwilliam marry Georgiana? I was so naive when I came up with that pairing; I thought I was the first to think of it. I only discovered afterwards how popular an idea it was in fan fiction generally. I actually think he wouldn’t marry her, or that he wouldn’t be good enough for Darcy. In my story, old Mr. Darcy sets the Colonel as a guardian because he thinks Ashwell is going to die and the Colonel will become the heir. If that doesn’t happen, then that plan kind of goes out the window. Maybe in marrying Elizabeth Darcy will begin to think differently about marriage, and if Georgiana loves the Colonel, maybe he would consent, but I think it would not be a foregone conclusion. And in Pride and Prejudice, we are lead to believe that the Colonel develops some interest in Lizzy, so maybe he is not that constant. I have written him to be a little bit self-pitying. He talks in Pride and Prejudice about how the second son of an Earl cannot choose his own happiness, suggesting that he has to marry for money otherwise he would have Lizzy. In my book, he is a bit sorry for himself about not getting Georgiana because he is not the heir. I think he wants what he can’t have in part because he can’t have it. On the other hand, Wickham is pretty self-pitying as well, and Georgiana nearly elopes with him, so maybe she has a thing for that sort of gentleman. In Pride and Prejudice, Elizabeth compares the colonel and Wickham in her mind, and finds that Wickham has more engaging manners, but the Colonel has the superior mind. So there is some suggestion of a parallel there I think. Perhaps they will end up together. I should note that I don’t like to speculate too much about what happens after the end of Pride and Prejudice. That’s why I wrote a prequel, because speculation is a bit precarious I guess. The idea of having Anne as hidden botany expert was a stroke of genius – how did you go about building her character, and what were the challenges? I think that idea just fell on my as I was falling asleep at night, and I might have actually laughed out loud at the notion. As I mentioned, I was interested in how people see themselves and how the world sees them. The world hardly sees Anne. Nobody speaks to her or really has any idea what is going on inside her head. She is almost an extraneous character. We do know that there was an intended betrothal between her and Darcy, but Darcy hardly seems to care. She doesn’t say a word in all of Pride and Prejudice. I really just thought it would be amusing if everyone so completely misjudged her, even Elizabeth Bennet. And it was actually very useful to have her as this trove of family secrets, to spill the beans at the end and clear up the misunderstanding. I had a great deal of fun writing her parts because she has absolutely no social skills. She is kind of like her mother in that she just dives into subjects without any niceties and bulldozes through delicate subjects. Nobody has ever taught her how to be sociable. She was raised by Lady Catherine and Mrs. Jenkins, who also says nothing in the whole book, so these are her models of womanhood. She turns out a strange blend of both, but with her own fire animating her. I could really hear her voice as I wrote her parts. It was women like her who trailblazed into the future and did really interesting things because they had so done with society, or in her case never really been part of it in the first place. Of the entire novel, which was the hardest part to write? The title. I went through so many working titles before I hit on Follies Past, which I was very happy with in the end. It comes from a poem by William Cowper, who was a favourite of Austen’s. I liked that because Jane Austen took the title Pride and Prejudice from a line in a novel, so I felt like it was appropriate. The word follies to us just implies sort of silliness, but it is really foolishness, and in Cowper’s works, and in its former usage had a sense of regret as well. I also liked that it was kind of an unpretensious phrase as well, because it’s just follies, nothing really heavy. Which Jane Austen character do you consider yourself most like? Without question, Emma Woodhouse. I always think more highly of my abilities than may be merited, I don’t like doing things that I am not instantly good at, I can do no wrong in the eyes of my father and I am always trying to run everyone else’s lives because I think I know what is best for them and because I care, if my caring is a little misguided a lot of the time. If you could ask Jane Austen her thoughts about any aspect of Pride and Prejudice – what would you ask? I have been sitting here trying to think of a question, and I just don’t have one. I think that is a sign of how complete the book is that it doesn’t leave any questions really. I suppose I might wonder about things that happen after the book, and I do think she might have considered those questions herself, but I would rather just talk about why she liked to write, what she thought about literature at the time, who she felt she was writing for, what she wanted to achieve, those kinds of things. The popularity of her books has come and gone over time and at the moment we think of her as academic chick lit, which I find unbearably obnoxious. I mean, is Shakespeare just for men because he was a man and his lead characters were largely men? And let’s not forget that ALL the actors would have been men. But that is another matter. I will probably write a blog post on that subject one day, if I ever get the time. Have you got any other Austen spinoff novel plans? I certainly do. I am planning a prequel to Sense and Sensibility, which I have mapped out in my head, but need to actually start typing out. I am organizing a costume ball here in Edmonton this fall, and doing a Kickstarter campaign for it right now, which is a lot of work. I have lots of those kinds of plans as well, bringing the Regency to life. I live for that kind of thing. And if I could add one thing, it would be to invite everyone to check out the trailers we made for the book. They are almost as much fun to watch as they were to make. They are on youtube, where you can also find the promo video for the ball. And thanks for the interview! If you’re interested in buying the book, you can do so on Amazon. You can also check out her website, Facebook, Twitter and Youtube. Overall, I’m so glad that I had the chance to come across this book. I completely agree with her about the parallels in the novels, and the themes, and it’s gratifying to read a piece of work from someone who has been so thoughtful about the book. Anyone else excited for the Sense and Sensibility prequel? Please tell your friends and pass on the details. Hope this appeals!